- - - Blessed Easter Season - - - Sweet 16 this year - see below ! . -With April "comes the showers", that "brings the May flowers" - T-h-i-n-k Spring ! Vintage Garden Tractor Show Sugarcreek,Ohio-May - Ashtabula Antique Engine Show-May July Sept . Elkton Antique Engine Show Lisbon Ohio-Georgian Bay Steam show Ontario Canada- Tuscarawas Valley PIONEER POWER Show August- Buckeye Steam & Gas Reunion August - A Show in Ravenna August 4th - Atwood Lake Ohio -October - Check out the Fall Show Button for show photos - more to come ! Robert Shick of Newton Falls Ohio. Bob passed on 11-1-2015. Bill Weise of Walton Hills, Ohio. Bill passed on 12-20- 2015. I sadly leave this news from March 1, 2018. Long time friend and fellow collector and a true advocate for collectors Larry Lipps of Jefferson, Ohio has passed on. 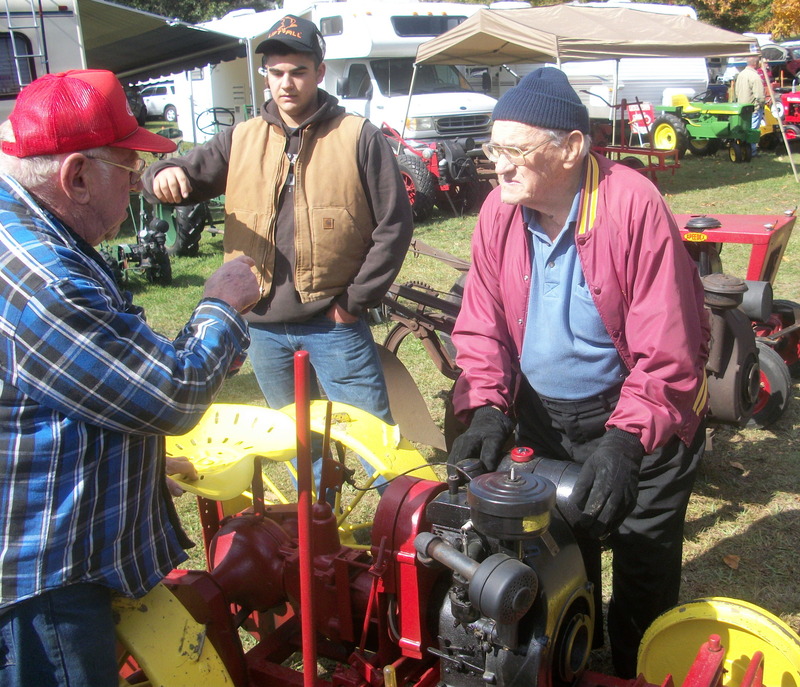 He leaves a great legecy of love for the Ashtabula Ohio Antique Engine Club of which he was there in the beginning and until recently served as President for 8-years. You could find him weekly working at the Engine show grounds in Williamsfield, Ohio. He will greatly be missed by all. Larry could alway be seen at the shows with his blue jeans, blue jean shirt, blue hat and a wonderful welcoming smile. 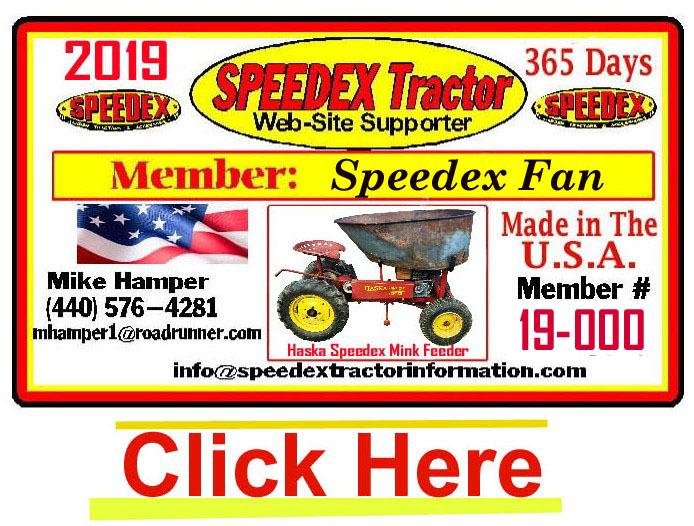 It has occurred to me that Probably the greatest function My web-site provides is the Ability for Speedex enthusiast all across the country to Net-Work with each other about their tractors. We need to take advantage of this opportunity in the ways provided thru the POST and Classified & Guest-Map on this Home page. I would like to thank all of our Veteran’s for their service and sacrifices for our country. Thank you! Photos of the Ashtabula Antique Engine show are in the Summer Show section. 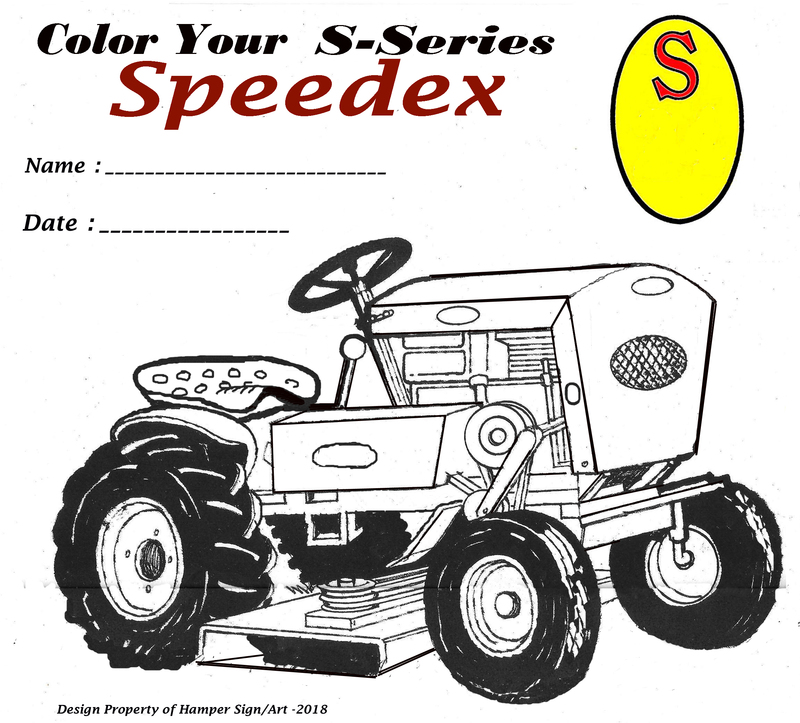 This is a COLORING photo Series I have drawn for the Younger Speedex Crowd. .. Many New Pictures 1-9-19 .. 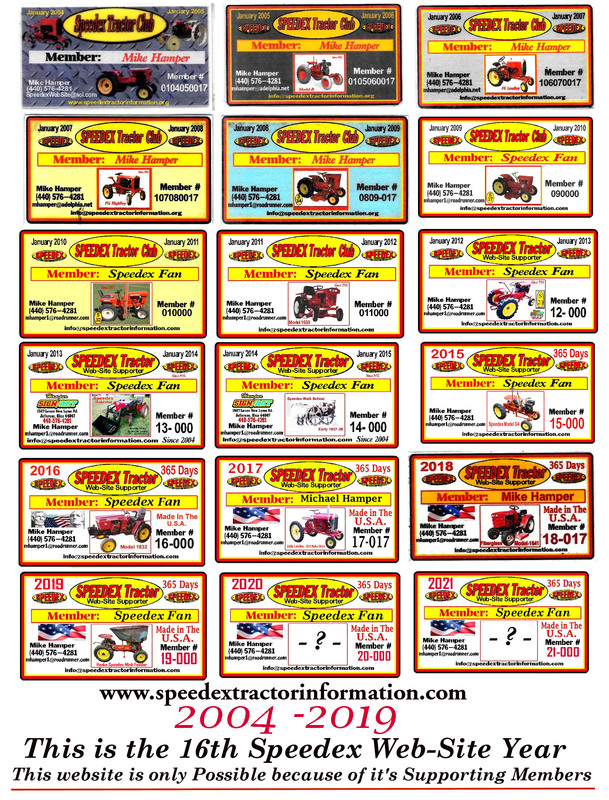 In 1935 Harold Pond founded the "POND TRACTOR COMPANY", and built Speedex tractors. ...Some worthy information to note before the Pond Tractor Co. started follows. Harold Pond was associated with Shaw Mfg. Co. of Galesburg, Kanas. Shaw Mfg. 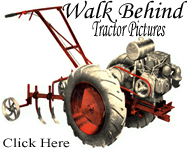 Co. fabricated walk behind tractors and other outdoor power equipment from reclaimed motorcycles and automotive parts. Harold Pond, his brother Elmer Pond, and brother-in-law, Glen Heilman all worked for the Shaw Mfg. Co. at one time. Harold was assigned Ohio and Pennsylvania as his territory for mat'l shipments of steel. During that time Harold conceived and developed the Speedex walk behind tractor. All three men were very motivated and would eventually create their own company’s. Harold's brother Elmer and his son Cecile were responsible for the development of the " Wheel Horse " line of tractors in South Bend Ind. Harold's brother-in-law Glen Heilman was responsible for developing the " Garden-All " line of garden tractors in Mishawaka, Indian. These three men would go on to be responsible for many innovations in the history of small garden tractor production. .... Now for Harold's part. 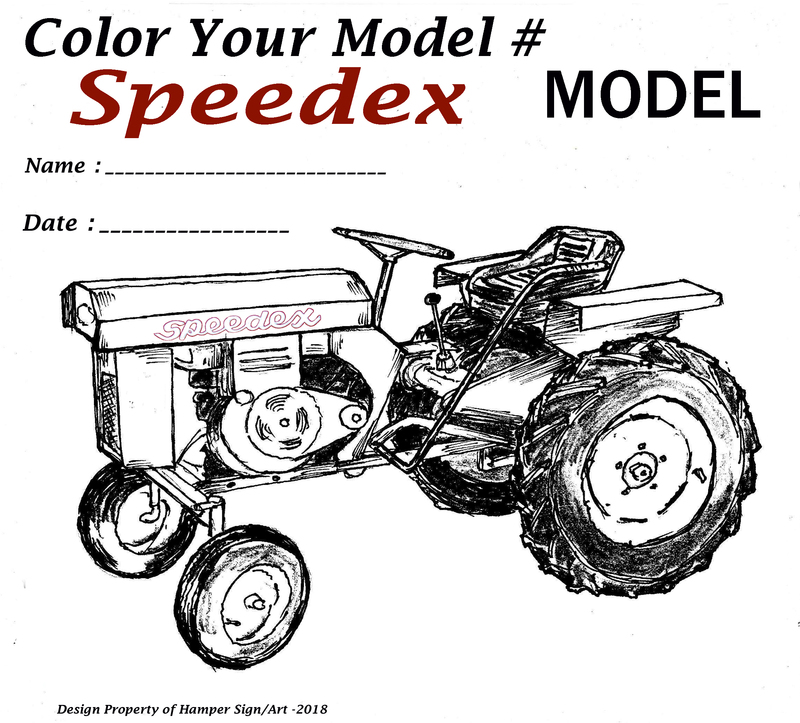 In 1938-39 Harold Pond developed the Model B Speedex riding tractor in Ravenna, Ohio. The Speedex Model-B is considered the first four wheel garden tractor in America with an air-cooled engine and pneumatic tires. It had tiller steering, pneumatic tires, Briggs & Stratton Model ZZ air cooled engine, a Ford Model-A transmission, and Ford Model-T rear axle. In 1939 Harold started a national advertising campaign to sell the Model-B tractors. 1941 The Model-B was sold with a 6HP Briggs engine. A 1941 Sales Pamphlet lists the Co. name as "POND GARDEN TRACTOR CO." the Model-B tractors were built in 1939,1940,1941,1942,1943-48. During this time he also developed the Model A and C walk-behind Tractors. In 1942 the Model FG ( Farm and Garden )was developed using a Ford Model A 4-cylinder engine, Model-A transmission, and Model-T rear axle. It sported the Model-A radiator and radiator shell. This first FG was a direct evolution of the Model-B having many of the same parts, which also included the 9 inch front tires. Later FG's were a higher designed tractor and did not have the shiny Ford Model-A radiator shell. This later FG did have larger front wheels ,12 inch, and had a Model-A rear axle. Some time in 1948 Harold was contacted by the Henry Ford, and was told that he was competing with Ford tractor business and that Ford would no longer be able to sell him components. The call from Henry Ford prompted Harold to develop his own transmission and rear axle design. 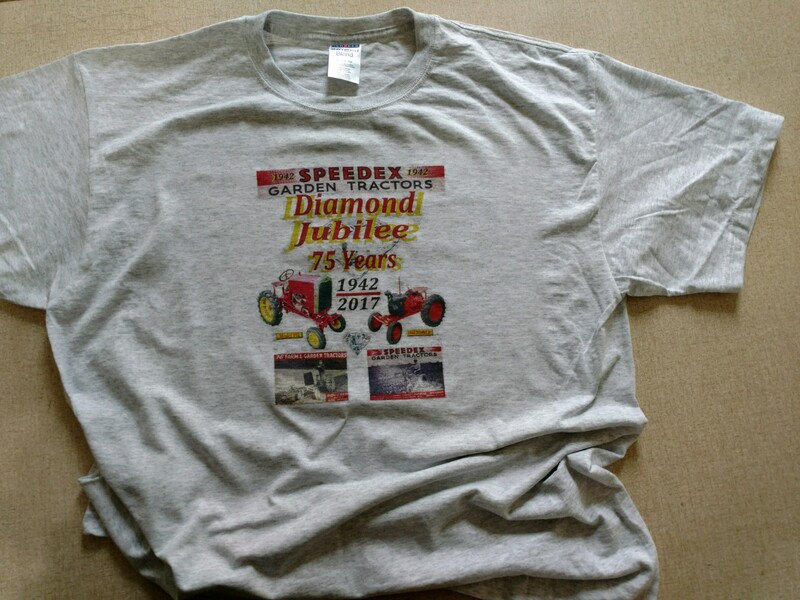 In 1949 Harold Pond changed his company name to the "SPEEDEX TRACTOR COMPANY". In 1950 Harold developed the M-23 and M 25 which utilized his new differential and transmission design. Several models proceeded from 2 wheel tractors to other 4 wheel tractors, the D-4, M-8, M-12, M-14, M-16, M-23, M-25 and WT two wheel walk behind.. In 1957 Harold Pond sold his company to Maury Foote and Jerry Stowe. 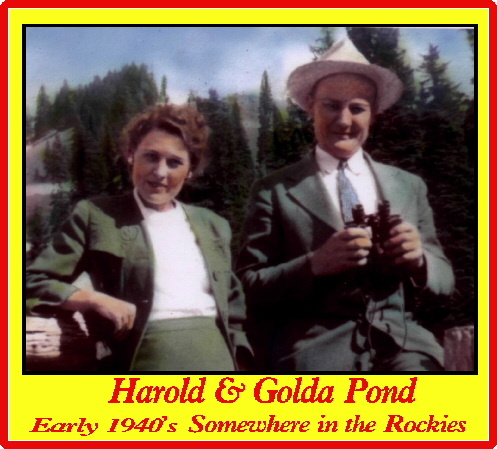 Harold and his wife Golda and daughter Marilyn then moved back to his native state and town of Galesburg, Kansas. Harold continued to tinker with some designs for other small items that did not reach production status. Born April 30th ,1905 Harold E. Pond died on Nov. 18th 1966 at the age of 61. 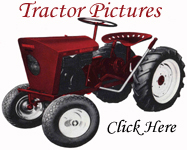 In a recent interview with his daughter she mentioned that her Father would be very proud to know of the present practical use and continued interest in his tractors.Tech International,Ltd of New Philadelphia, Ohio still offers parts for many of the Speedex line of garden tractors. 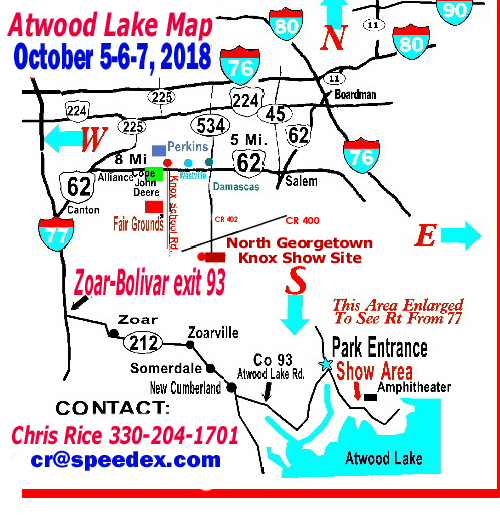 Atwood Lake Map for tractors Click on map to enlarge for better viewing. 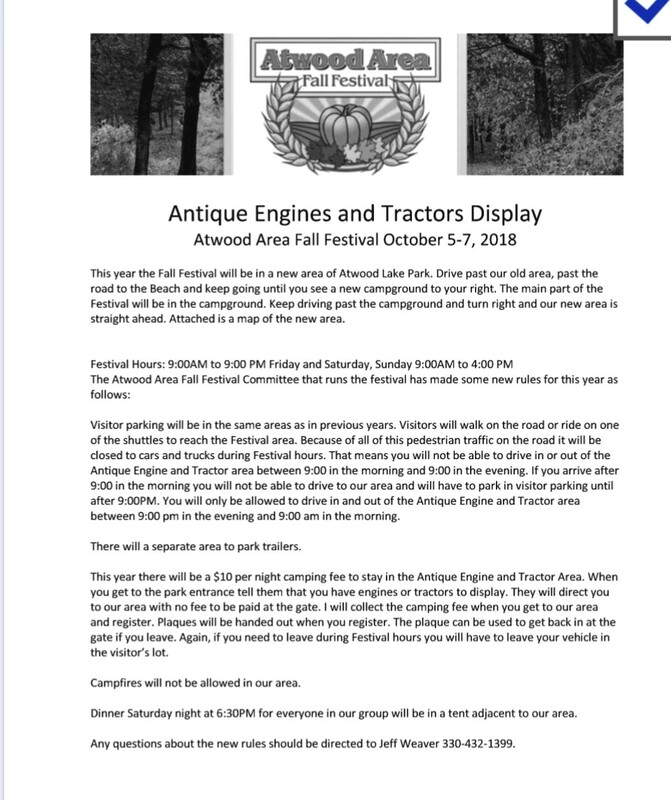 Atwood Lake tractor area camping New Rules - Click on photo to enlarge. 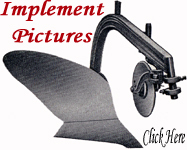 Click on button to Open the link to the site. 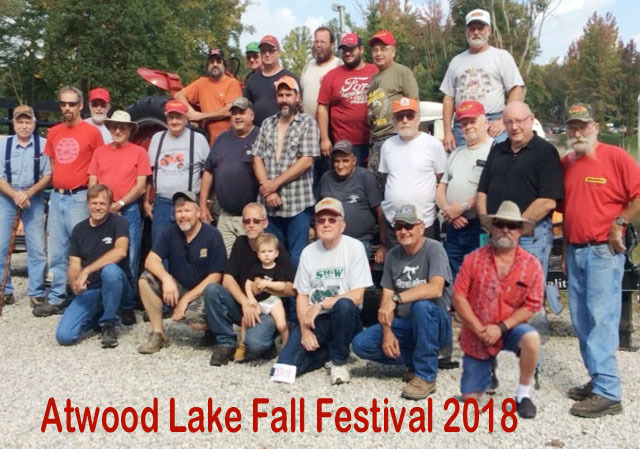 October 5-6-7, 2018 Atwood Lake Fall Festival here in Ohio. 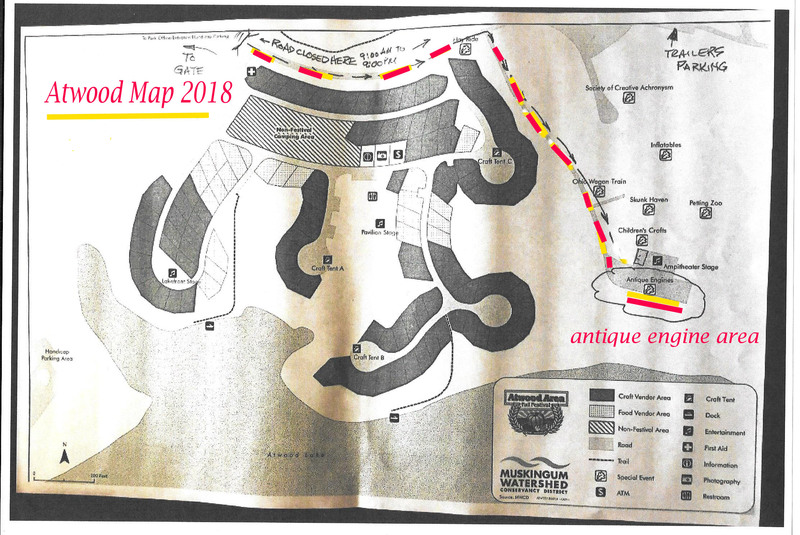 this year we Speedex attenders will most likely be located in the New Show Area.